When Jake Peavy came into the league, almost 85% of his pitches were either a fastball or slider. Now? “I throw just about every pitch in the book at this point,” the 33-year-old pitcher said. It’s all part of evolution — not only due to changes in his stuff and his mechanics, but also due to changes on the league level. Even in the last seven years, for which we have reliable PITCHf/x data, league-wide trends are apparent. The low strike is getting called more, pitchers are throwing more two-seamers down in the zone, and all pitches are moving downward (all pitches 2007 on the left, 2014 on the right). The other impetus for more four-seamers came from his changed mechanics. Peavy admits his arm slot is a bit higher than it’s ever been before. Looking at his release point data doesn’t give us much of a clue, but often the angle between a pitcher’s head and his arm can be more instructive than raw release point data. In a great Q&A with David Laurila, Peavy tells us that his arm slot changed after he hurt his ankle in 2009. 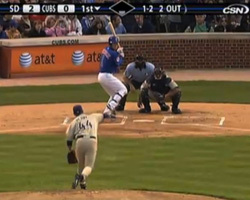 Let’s compare the angle between his arm and his head back then in 2009 and then from his last start in Chicago this season. He does look more upright recently, if you focus on his head and the angle of his back. And going more upright means that his pitches behave differently, since arm angle determines much of the direction of the ball’s spin. “It changes the way the ball’s going to move out of your hand,” said Peavy about his more upright posture these days. Of course, age confounds some of this, but still the differences are stark. 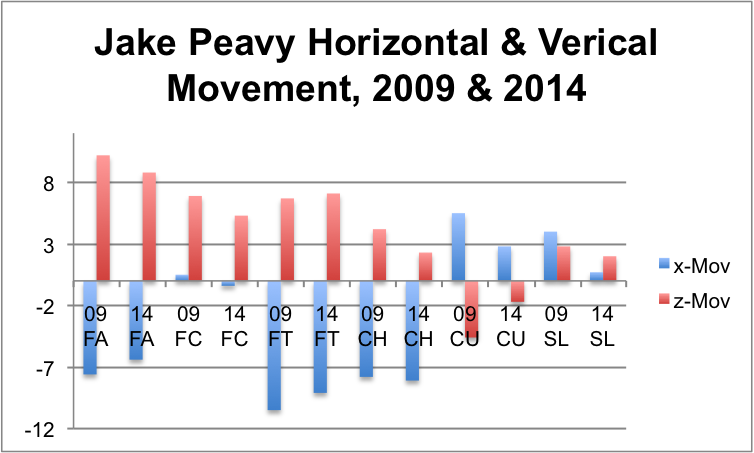 Look at the horizontal and vertical movement numbers on his pitches in 2009 and 2014. In general, note how the positive red bars — representing his vertical movement — have mostly dropped, meaning he’s getting more drop out of his pitches. 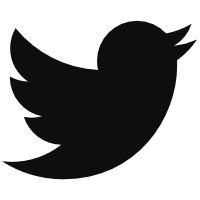 At the same time, the blue bars — representing his horizontal movement — seem to be ‘slimming’ or moving closer to zero in large part. 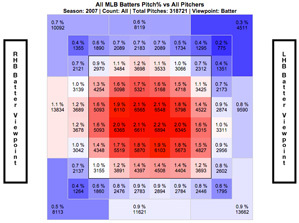 Some of his pitches have had to change grips because of his reliance on the four-seamer over the two-seamer. 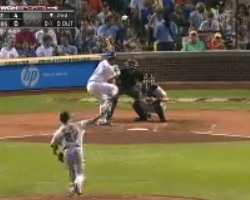 He prefers to use the four-seam change with the four-seam fastball, and two-seam change with the two-seam fastball. And so he’s transitioned slowly from the two-seam change grip (left) to the four-seam one (right) as his fastball mix has changed. 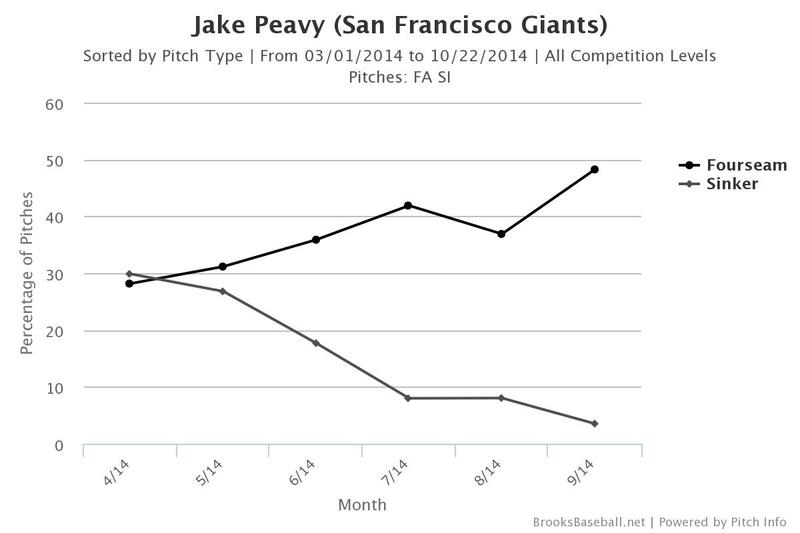 In terms of movement, it’s not easy to see the difference in Peavy’s changeup over time. If you fool with the yearly filters on this chart, though, you might notice a bit of a movement down and to the right — which would mean more vertical drop and less horizontal movement on his change. That could come from a slight alteration of his grips. Even in the graph above, you can see that he’s getting more drop on his change these days. 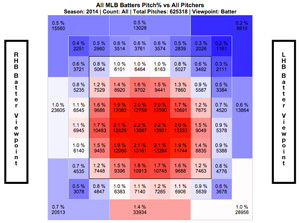 Another huge change from Peavy’s early years is a gradual move from the slider to the cutter. When he debuted, Peavy threw the slider almost a quarter of the time, without any cutters. That’s morphed to about 20% cutters and less than ten percent sliders in recent years. PITCHf/x algorithms have a hard time classifying the two, since they are so close in movement, but Peavy confirmed that he has both. “Even though they are very similar, the cutter is a version of a fastball so you’re going to throw it more like you throw a fastball,” Peavy said. “You want the cutter to be as much like a fastball as it can be.” You can see that the grips below (slider on the left, cutter on the right) are very similar, but Peavy’s hand position upon release is very different. As Zack Greinke pointed out, it can be hard to throw two pitches that are so similar. “I’ve really had to work hard to keep the slider being a slider and the cutter being a cutter,” Peavy agreed. Why has he made the move then? He wanted another reliable pitch. He’s even working on the splitter he tabled late last year. He wants to evolve. “I throw a little bit of everything,” as the pitcher said. There’s a give and take over the course of a pitcher’s career. As your body robs you of velocity, your experience gives you more wisdom — and new pitches. The league can change around you, and you can use that knowledge to beat the hitters just as they try to do the same to you. The most important, thing, though, is to avoid being predictable once you’ve established some strengths. We hoped you liked reading Jake Peavy On Keeping Them Guessing by Eno Sarris!